Just back from Croatia and Bosnia and Herzegovina. It was a great trip and a much needed break. 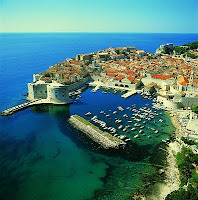 We flew with Aer Lingus from Dublin to Dubrovnik and stayed at Hotel Lapad, Dubrovnik. I highly recommend the trip. Weather in Ireland when we returned - wet, windy and miserable! Airport new and modern but too small with no newsagent etc.